(MATT) We woke early (6:30 a.m.) to try to make Mass at St. Peter's. We made it to St. Peter's around 9 a.m. (after a quick stop at a supermarket for brunch) and saw the end of and received blessings at 3 Masses--but technically we missed Mass, again. We walked back to the car, met up with Chris, ate and looked for a place to buy relics for a few minutes. We gave that up shortly after and got in line for the papal audience. After getting in the wrong line, waiting for Jon to give away our extra tickets and waiting in the correct line and finally waiting for one hour til the Pope was supposed to come and then waiting 45 minutes 'til he actually did come, we got our audience. He spoke in many languages first. As each group was announced they stood up and cheered. He eventually spoke in English and all I can remember is his exhortation to life. Sorry. He did give us a blessing and extended it to our families and our sacramentals. Luckily, because Collin and A.J. wanted stuff blessed by the Pope. I was prepared with six rosaries and a bunch of medals. 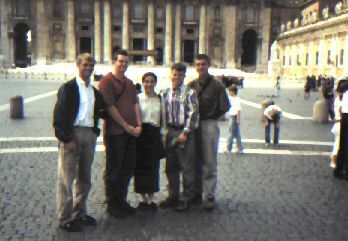 Another interesting thing happened as we waited for the Pope that day. As we chit chatted and napped, suddenly Sam stood up and said, "Matt, stand up." I asked why and he just said stand up and tell me what you see. I stood up and looking about said, "Could you be more specific?" He said, "Over there in the white shirt and black hair." I, after a few seconds said, "Male or female?" Suddenly, I saw her. The girl that both Sam and God showed an interest in. I cannot fathom how he spied her in that mass of people. It must have been God's good will toward Sam after taking his girl. It was kind of like God giving Sam a pat on the back after beating him in a good game of volleyball. Sam stood and looked at her for a while in hope he could catch her eye, but to no avail. Eventually, Jon and Sam went to the edge of our section and sent a lady to get Melissa. "Melissa Guarnizo?" the lady asked. "Yes," said Melissa, mind racing to figure out how she knew this strange woman. Everything became clear as she pointed up the stands to Sam, Jon, Chris, and I, standing in the crowd. She came right over and was so surprised and happy to see us. She kept saying, "I cannot believe it." We chatted for a few minutes, Mel doing most of the talking and agreed to meet at the obelisk in the center of St. Peter's Square after the audience. We did meet and drove together to the Piazza Navona for lunch at a place Melissa knew. We all had a light lunch while Melissa told her tale. She is joining the Reformed (discalsed) Carmelite convent in Avila, Spain. (She couldn't believe that we had skipped Avila in our trek through Spain--even going so far as to suggest that it was sinful.) She was very happy to see us, Sam mostly I suspect and I think she said that it was Divine Providence for her to be able to say goodbye. Sam was very quiet all day and listened to her mostly. I had asked him when we first seen her if his heart jumped and he said no. I didn't buy that for a minute because mine jumped and I didn't even date her. I said as much to Sam and he admitted that his heart did indeed jump. That's about as intimate and emotional as Sam gets around us so I let it go at that. We ate very slowly. Melissa and Sam didn't really eat at all. Mel talked mostly and Sam just sat, nibbled his pizza and listened. Her name will be Juana Marie de la Cruz. John of the Cross was the spiritual father of their order and the Marie was from the holy day of their order, January 19th, on which a nun died, making room for Melissa thus confirming to her that it was this place she would go. It was a good day--sad in a way, especially for Sam, I think. As we were parting, we didn't know just how to go. Melissa eventually suggested that we meet the next day to sight see together. So we parted ways at that. The catacombs were next. We got there just in time to catch an English tour. We saw the tomb of St. Sebastian and some ancient graffiti that indicated Christians had been there. In the Church above, we saw the bones of St. Sebastian, that had been brought up from the catacombs. After that we went to the last of the four major basilicas in Rome, St. Paul Outside the Walls, the place that Paul was beheaded since he was a Roman citizen. We arrived late in the day, but were able to catch Mass with a few of the local old timers. All of the pictures of the Popes were all around the church--and there were only eight spaces left! Hm, makes you wonder, doesn't it. Well, before any of you readers start feeling like prophets, know this: In the early 1800's, St. Paul's had no more places left and self-proclaimed prophets like yourselves saw it as a sign that the end was near. Well, the story goes that the church burnt down at that point and the new church (the one we saw) was constructed with ample space for more popes to come. So know this: keep your thoughts to yourself, for none know the day nor the hour and if you go blabbing your mouth another perfectly good church may be destroyed by God. We decided to go back to camp after that. We had skipped lunch and dinner, so we decide, after discovering that all the supermarkets were closed, to just have a beer at camp. We tried to play a game of volleyball first and Jon and I eventually made it in (against the will of some Contiki people) for a quick game. Then up we went to the bar. We all ended up at a large table with a Contiki group who all loved each other very much. I found them dull and boring (except for a New Zealand guy Sam was talking to) and eventually left to shower and write a letter. Jon talked to Teresa from New York for most of the evening and eventually walked her back to her cabin but fled like a man when she invited him in. Sam's conversational pal was Roachy and Sam did not walk him to his room. Chris talked to a couple of girls, one of which drank alot and the other will only be remembered as Teresa's friend.